Wanted: A bold adventurer who wants to travel the world from a comfortable and safe spot behind a desk that has seen the likes of kings and queens, paupers and princes. A humble book and rare manuscript shop seeks a keenly intelligent investigator to assist us in our search for things thought lost, and in our quest to return lost items to their rightful owners. 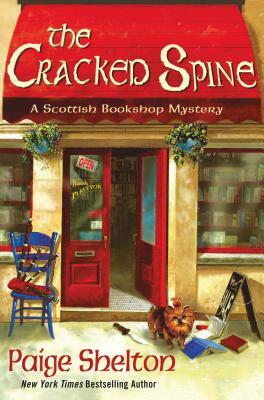 Never an adventurer, no one was more surprised than Delaney Nichols when she packed her bags and moved halfway across the world to Edinburgh, Scotland to start a job at The Cracked Spine, a bookshop located in the heart of the city. Her new boss, Edwin MacAlister, has given her the opportunity of a lifetime, albeit a cryptic one, and Delaney can’t wait to take her spot behind the desk. The Cracked Spine is filled with everything a book lover could want, each item as eclectic as the people who work there; the spirited and lovable Rosie, who always has tiny dog Hector in tow; Hamlet, a nineteen-year-old thespian with a colored past and bright future; and Edwin, who is just as enigmatic and mysterious as Delaney expected. An extra bonus is Tom the bartender from across the street, with his cobalt eyes, and a gentle brogue—and it doesn’t hurt that he looks awfully good in a kilt. But before she can settle into her new life, a precious artifact goes missing, and Edwin’s sister is brutally murdered. Never did Delaney think that searching for things lost could mean a killer, but if she’s to keep her job, and protect her new friends, she’ll need to learn the truth behind this Scottish tragedy. PAIGE SHELTON had a nomadic childhood as her father's job as a football coach took the family to seven different towns before she was even twelve years old. After college at Drake University in Des Moines, Iowa, she moved to Salt Lake City where she thought she'd only stay a couple years, but she fell in love with the mountains and a great guy who became her husband. After many decades in Utah, she and her family recently moved to Arizona. Her books include Of Books and Bagpipes and The Cracked Spine. “Move over Claire Fraser; American bibliophile Delaney Nichols is about to take Scotland-and legions of cozy mystery readers-by storm! As warm and inviting as a cup of tea and a serving of fresh-from-the-oven shortbread. Readers will fall in love with The Cracked Spine.